I realise that this particular piece wasn't present at Rorkes Drift but there were a pair of them at the Battle of Isandlwana and it is theoretically possible that one might have escaped back to Jim's place. Also, I'd like to think that I might get to eventually play something other than Rorke's Drift. Oh and I think that this is a lovely set that is made that bit better by the marvellous base from 4Ground. I realise that you can get this set for 10% less from other places but I quite like the 4Ground idea where it comes at the RRP but with a specific base. If I had to find fault it would be that the figures end up a little too far away from the gun itself but they're fine for gaming purposes. I'm reasonably pleased with how these guys turned out. Anybody who's seen my BUF forces for 1938 VBCW will know that I struggle with black uniforms. The Sergeant's stripes were a little fiddly for me, I struggle to paint straight lines like this freehand so ended up using Baal Red wash to attempt to capitalise on the detail. 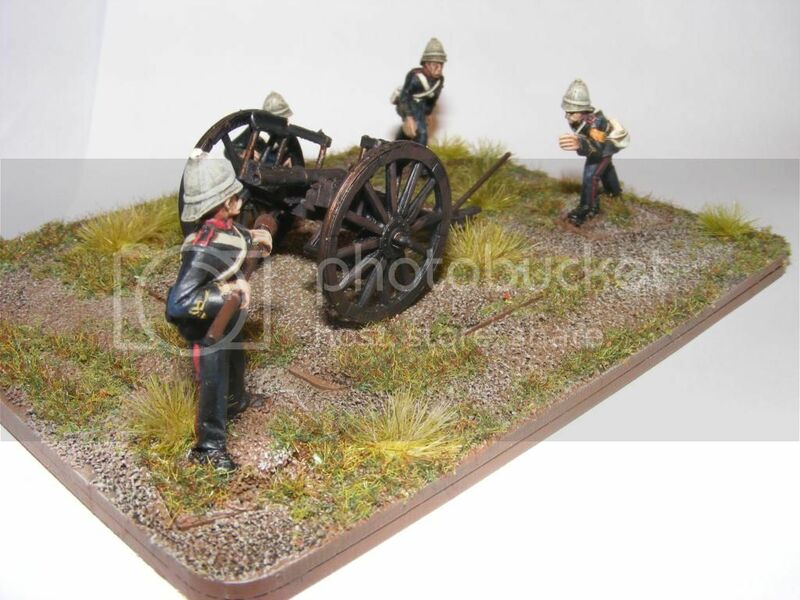 Anyway, here's the biggest gun of the Anglo Zulu War that I've painted yet. That is a clever idea and a beautifully textured base. 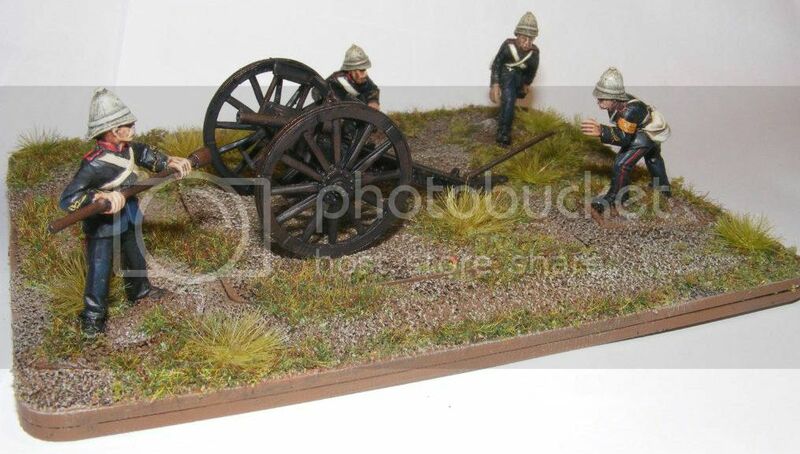 Is the idea that you can remove artillerymen as they are wounded? Excellent paint job and the base looks great. Love the 4ground base I like how easily the figures fit on to it. Thanks chaps. I believe that ease of removal is the idea. They certainly didn't go in that easily at first after painting, I'd forgotten that laser cut = very precise so not much room for paint!